This is great to use as leftovers. The beef can be used on sandwiches or tossed through pasta the next day and used for lunch. You can use pasta instead of gnocchi here too. Heat the oil in a large saucepan set over a high heat. Pat the beef dry, season with salt and pepper and fry two pieces at a time for 4 to 5 minutes on all sides, until browned. Remove from the pan and cook the other two pieces the same way. Add the beef back to the pan along with the onion, garlic, thyme and bay leaf. Sauté for a further 5 minutes, adding a pinch of salt to help soften the onion. Stir through the tomatoes, tomato purée and red wine. Bring to the boil, then reduce the heat, cover and simmer gently for 2 hours, until the beef is cooked and tender. Remove the beef from the pan and shred it onto a plate using forks. Put the pan back on the heat without the lid and simmer for 10 to 15 minutes, until the sauce has slightly reduced. 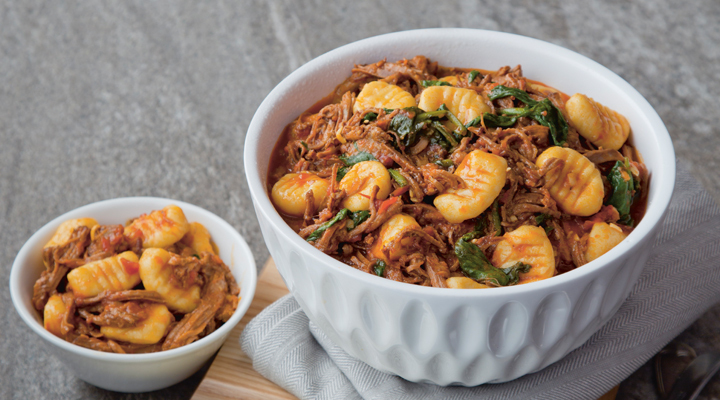 Add the gnocchi to the pan along with the shredded beef. Cook for 2 minutes or according to the gnocchi packet instructions. Add the spinach and half the cheese and stir through. Transfer to a serving bowl and serve the remaining cheese on the side for sprinkling over.